In a separate bowl, mix the flour, salt and baking soda. Slowly add dry ingredients to wet, along with chocolate chips, until just combined. Using a one-inch cookie scoop to measure out dough, place a single Oreo™ between two equal scoops of cookie dough. 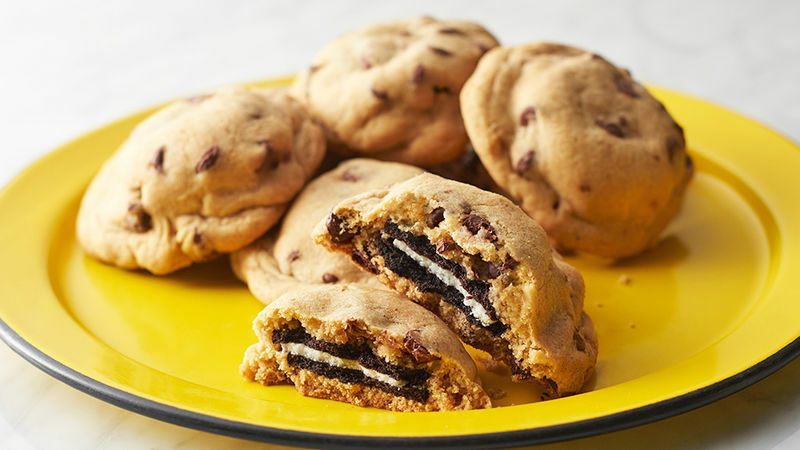 Use your hands to mold the dough around the Oreo™ until edges are sealed and cookie is completely enclosed in dough. Repeat with each cookie until all dough is used. Place onto a parchment-or Silpat™-lined baking sheet. The cookies will expand a bit when baking, so use two pans if necessary to provide enough space between them. Bake 11-15 minutes or until golden brown. Let cool for 5 minutes before transferring to cooling rack. Sure, you could whip up a quick batch of chocolate chip cookies with refrigerated cookie dough or with a mix, but making chocolate chip cookies from scratch is totally worth the effort. Since you’re going to the trouble anyway, you might as well take an extra minute or two to stuff them with an Oreo™ cookie, right? We used a classic Oreo in this recipe, but why not experiment with other flavors like chocolate, peanut butter or birthday cake? The only thing you’ll regret is that you didn’t think of this sooner.